After changing the snippets for Twitter accounts, Google now displays the latest headlines in the snippets for news sites. Search for [washington post], [nytimes], [le monde], [gazzetta dello sport] and you'll find the latest news from the snippets. Probably the best way to try the new feature is to search for [news] and check the new snippets. It's likely that the headlines are obtained from Google News, but not all the sites included in Google News have the new snippets. Looks awful! Not useful with just text and not links to the actual articles. People dont read headlines, they read articles. Will not work properly as Google use GoogleBot for this. What happens with the news that JUST HAPPENED! Another thing. The US version of Google News is pretty bad and the main reason people don´t use it is because it is too crowded with widgets, links and icons. Why does everything need to be extremly visible and on the front page. 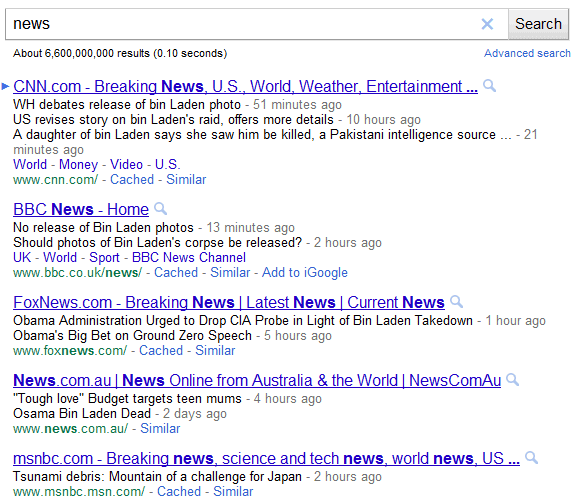 I would like to se a service that combines both Google News and Google Reader. The bad example: Google Reader, News. The good example: Flipboard. You should have a look on google before leaving a comment. It's not text but links. We also have this presentation in France.It looks like it only works on google news web sites. Everything Google does seems to be trending toward making search more of a giant popularity contest, not quality delivery of info / content in response to a query. I realize that there is something to user "votes", but I hope content remains to be king going forward. Maybe I am being naive.